We got up, sorted our bikes out and went for a ride in the Italian sunshine for 3 1/2hrs. Then we got back to the Belvedere Hotel and watched Paris-Roubaix on the telly. Every Sunday should be like this. Italy in the spring is pretty special and we’ve had a perfect day of it in the bumpy countryside around Riccione. Cloudless. Warm. Warm. Cloudless. There are a whole bunch of us from road.cc here this week: me (obvs), Big Dave and Little Dave from the editorial side, and 14 readers. The format is simple: everyone chooses from three different rides that vary in terms of distance and speed. I rode with the Explorer group today. We had an 80km ride lined up with 1,300m of climbing. Nothing too difficult. If you want a leisure ride, that’s fine. If you want a training ride, that’s fine too. You just sign up for the right one. The terrain around here is lumpy. You can find some big climbs if you like, but in the main the hills are fairly short (by Continental standards): 2km here, 4km there. You get the occasional switchback, but not loads (again, unless you go in search of them). That said, we came down one hairpin-strewn descent today. Lovely. Go wide, slam on the brakes, lean in and clip the apex, swing out wide again. Beautiful. On to the next one. You can take the hills – and everything else for that matter – at your own speed. There really is no pressure to go into the red zone unless you fancy it. Everyone regroups from time to time. That’s the way it goes. If you like castles, town walls and bella vista, you’re in for a treat. I reckon you see turrets about every 20mins on average. The same goes for photo-opportunity panoramas. If you want a good excuse for stopping when you get to the top of a climb, they’re not hard to find. 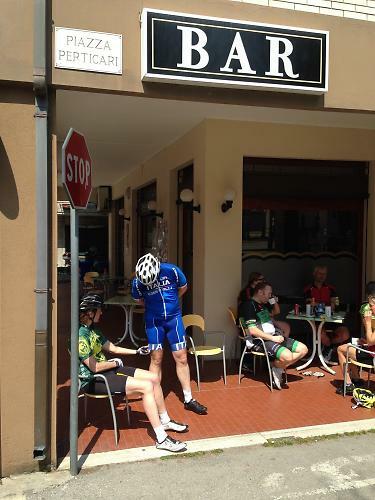 There’s an obligatory mid-ride café stop too. Coffee, croissants, chatting, that sort of stuff. The road surfaces, let’s be honest, could be better. The Romans were big on roads back in the day, weren’t they? Two thousand years on and the Fosse Way is still going strong. The Italians peaked early and have let their standards slip a bit lately. A couple we rode over today make Carrefour de l’Arbre look smooth. As long as you’re happy with that, you’re in for some fun. I loves ’em, me. Think of them as adding character. Hey, I need to head off for dinner so I’d better wind up for the day. It’s pasta, naturally. Do you really have to go to work tomorrow? If not, sack it off and head out to Riccione. The forecast is good. Whether I drew the short straw or the long one would depend on your point of view, but it was the road group for me today, 'road' here meaning 'quick' and also 'hilly'. 1,700m of climbing in 100km, said last night’s crib sheet. 40km in, we'd already knocked out 1,100m of that. Fair to say it was a challenging start to the week. Felice was the guide. Felice is fast. Luckily for me a chest infection and two weeks off the bike had taken the edge off his early season pace. He still had plenty to tow us most of the way round though. Unluckily for me the Norwegian duo of Øystein and Frank were on hand to sub themselves in and dish out the hurt on the climbs. Thanks, guys. I think. The first ascent, to Montefiore Conca, was a lovely swooping spin on fine tarmac. After a sharp drop back down to the valley, and a reminder that the road surfaces round here are not all great, next up was a bottom gear winch to Gemmano: at 2.6km and an average of 10%, it was easily the toughest climb of the day. Then it was down again and then up again to Onferno. And then down. And then up. See a theme emerging here? After Sassofeltrio the cliffs of San Marino loomed large in the sun [rub it in, why dontcha? Ed] and we climbed to the ridge and took the road along the base of them, craning our necks to pick out the castles poking out over the edge 200m above us, before dropping down and briefly back up for a well-earned coffee and a croissant in beautiful Verruchio; a croissant [what’s with all the croissants? Ed] made even sweeter by the knowledge that that was basically it for the climbing. Our route home was a quick big-ring smash down the valley followed by a fiddle through the back roads between Rimini and the hills, mostly flat and quick riding in the midday sun [there you go again - Ed]. Conditions right now are perfect for us Brits - sunny and clear [tch! - Ed];not too hot that you cook on the climbs but warm enough that you can leave your armwarmers in your room and work on your tan lines. We didn't quite make our 100km. In the end it was about 94. And we didn't quite reach 1,700m of climbing either, ending up about 100m short. But it was tough enough for day one, cheers.